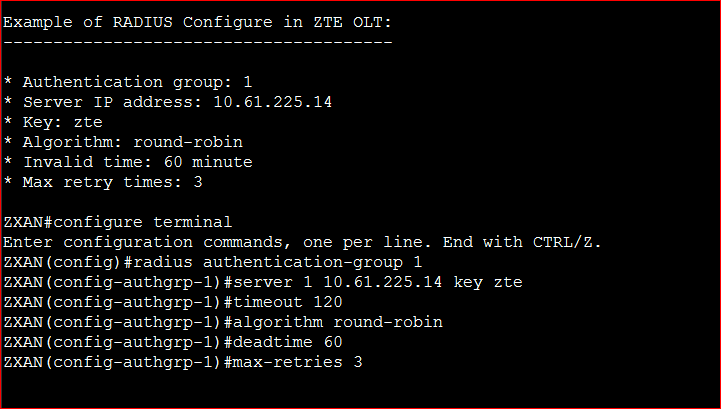 Today i will be discuss how to RADIUS Configure in ZTE OLT. RADIUS is a standard AAA protocol. The ZXA10 C220 supports RADIUS authentication for Telnet user. Step-2. Use the radius authentication-group command to configure RADIUS authentication group. Step-3. Use the server command to configure RADIUS server. Step-4. Use the algorithm command to configure RADIUS algorithm. Step-5. Use the timeout command to configure RADIUS time-out time. Step-6. Use the deadtime command to configure RADIUS invalid time. Step-7. Use the max-retries command to configure RADIUS maximum retry times.